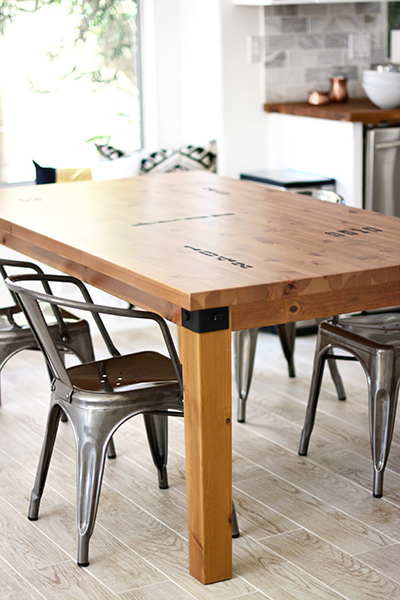 As the weather begins to cool, spending more time indoors becomes a reality. For this reason, fall is a great time to start tackling those interior projects you have been pushing off. 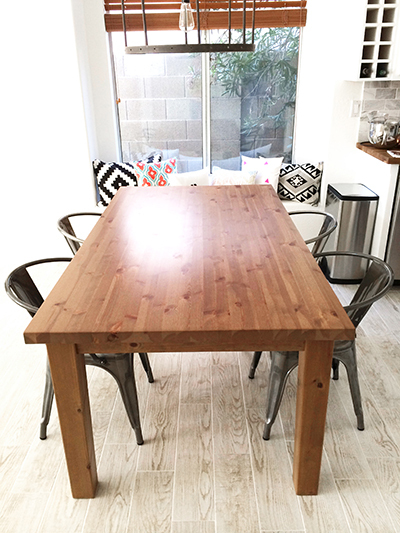 One project I recently tackled was my kitchen table makeover. I gave our plain and boring eating apparatus an industrial update. And to celebrate we hosted a homemade pasta dinner! 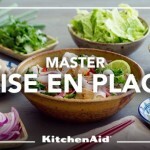 Here are my step-by-step instructions for my kitchen table makeover and the Caprese Spaghetti we made using our KitchenAid® Professional 620 Bowl-Lift Stand Mixer and KitchenAid® Pasta Roller & Cutter Set. I hope you like them! Here is the before picture of our table. Not bad, but not good…right? 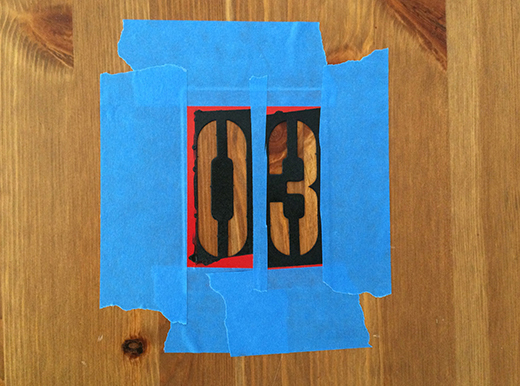 First, spray paint your numbers on the table. We used numbers that were meaningful to us, like our wedding date. If your brackets and bolts are silver like mine were, paint your brackets and bolts. 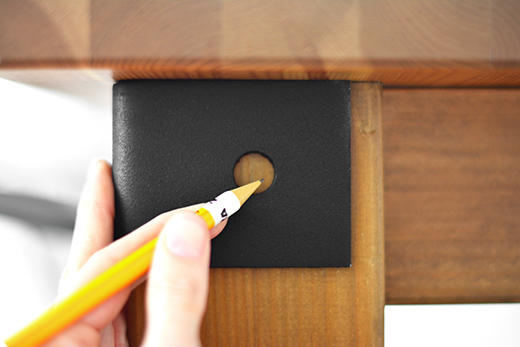 Next, mark where your holes need to be using a pencil. Drill holes where you will screw in the bolts. 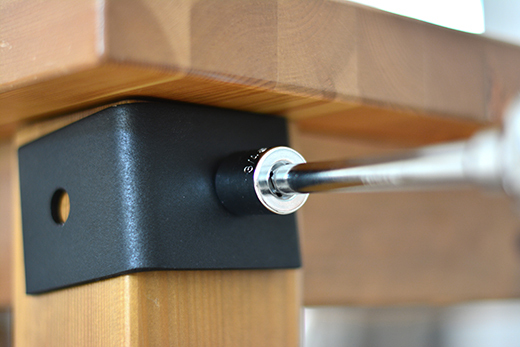 Using your socket wrench and bolts screw a bracket onto each corner of the table. Voila! What do you think? Now on to the pasta. 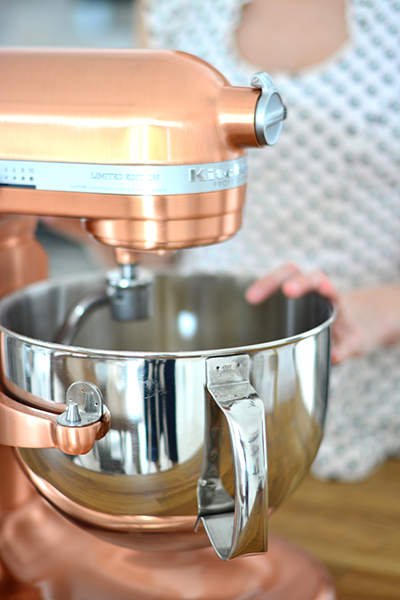 Add flour, eggs, salt, and water to your KitchenAid® Professional 620 Stand Mixer bowl. Attach the flat beater. At speed 2, mix for 30 seconds. Exchange flat beater for dough hook. Knead for 2 minutes on speed 2. 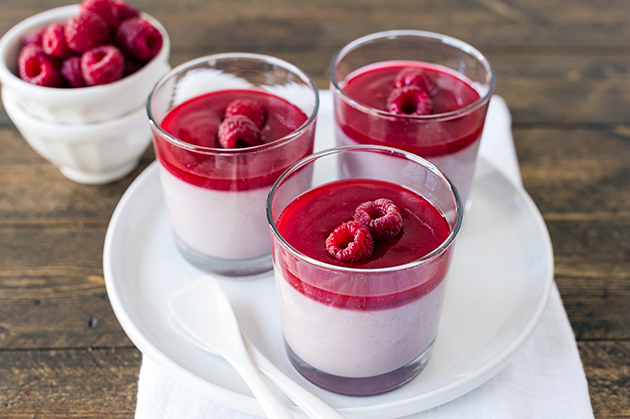 Add water or flour if necessary to get the right consistency. Dough should be firm and leathery but pliable. 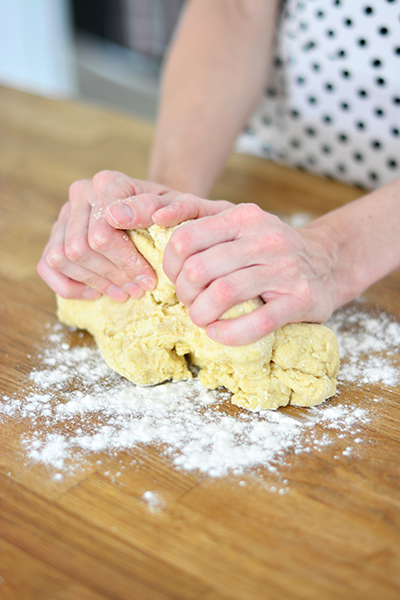 Knead dough by hand for 1 to 2 minutes. Let dough rest for 20 minutes. 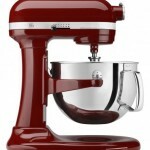 Attach KitchenAid® Pasta Roller Attachment onto Stand Mixer. 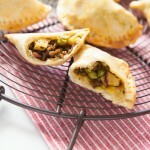 Cut dough into 1 cm thick pieces. Flatten each piece slightly. Set adjustment knob to 1 and speed to 2. Feed dough through the roller. Fold the dough in half and feed it through again. Repeat a couple of times. Then turn the knob to 2. Feed dough through. 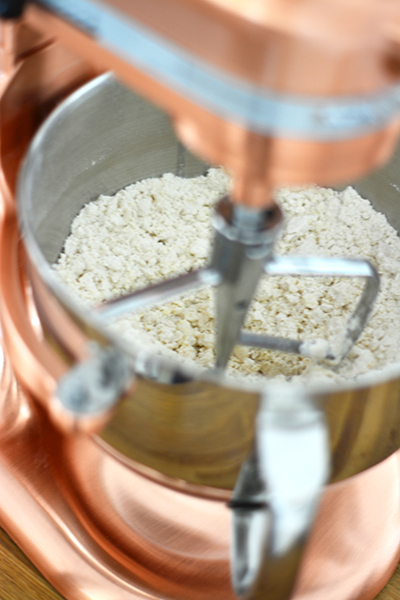 Continue to turn knob up and feed dough through until desired thickness is achieved. At settings 2 or higher, no need to fold the dough before rolling. 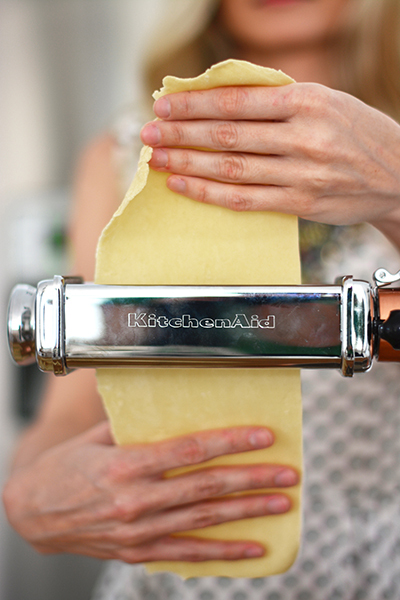 Exchange the sheet roller for the KitchenAid® Spaghetti Cutter attachment. Feed flattened pasta sheets into pasta cutter. 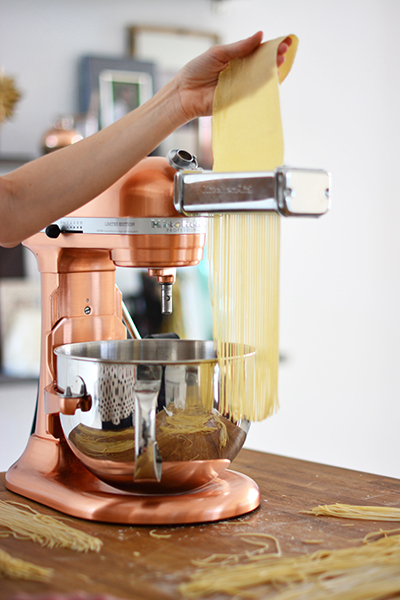 Pasta can be dried for no more than an hour or cooked immediately. 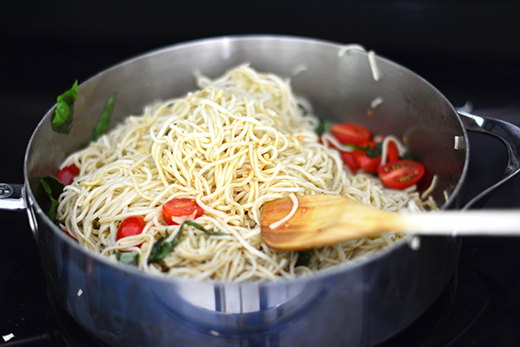 Store dried pasta in an airtight container in the refrigerator or freezer. Add 2 teaspoons salt and 2 tablespoons olive oil to 6 quarts boiling water. Cook at a boil until pasta is “al dente.” For fresh pasta, cook for about 2-5 minutes, and for dry pasta cook for about 7 minutes. Drain pasta in a colander. Sauté the garlic in 2 tablespoons of olive oil on medium heat. Be careful not to burn the garlic. 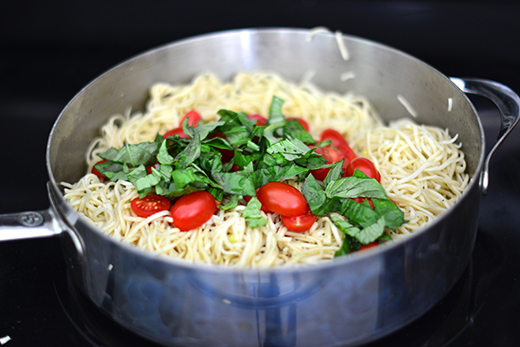 Add in cooked pasta, tomatoes, basil, lemon juice, remaining olive oil, mozzarella, and salt and pepper to taste. Sauté for another 5 to 10 minutes on medium heat until the tomatoes start to break down slightly. 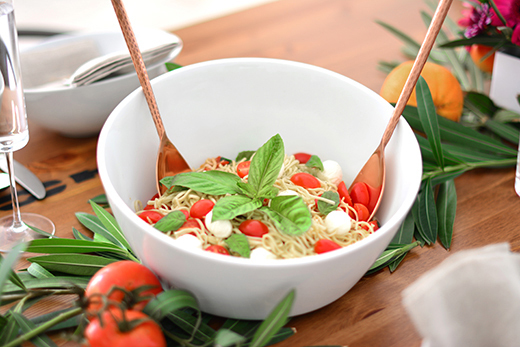 Serve in a large bowl and garnish with salt, fresh basil, and grated parmesan. Now it’s time for the party. 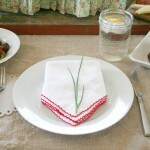 With a few items I had lying around the house, I put together a noteworthy table setting. I adorned each place setting with a napkin and place card. 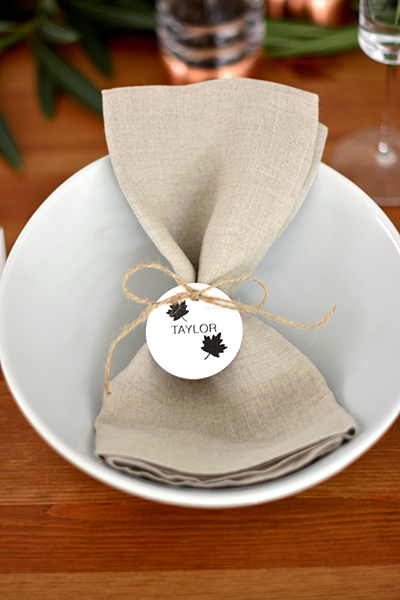 For your convenience, you can print these place cards right from your computer: click here. I decorated the table with a centerpiece I made using store bought flowers and foliage from the backyard. 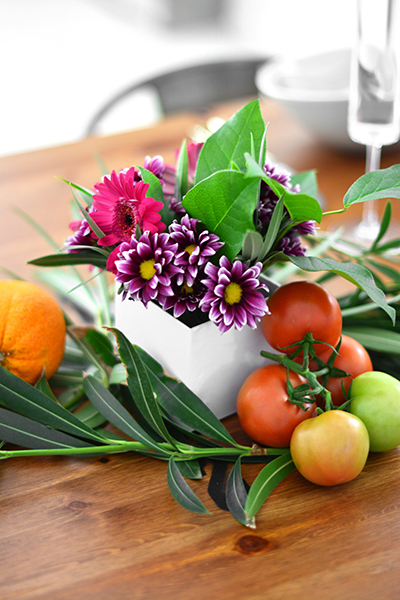 The white vase is nothing more than a white box with a glass inside. I call it the white vase trick. You of course have to do a little tasting while you are setting the table and preparing a meal. 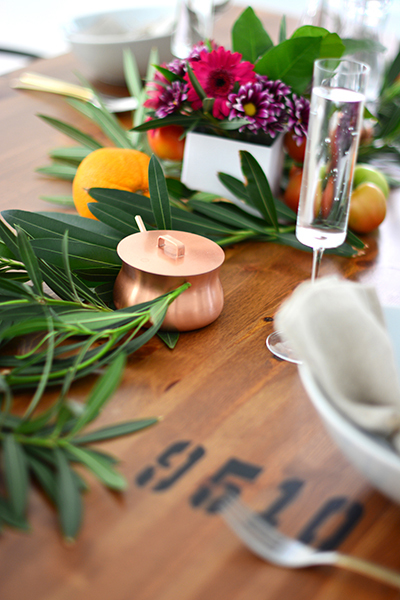 Copper details on a table with bright pops of colour go a long way. I was so impressed with how the numbers turned out. 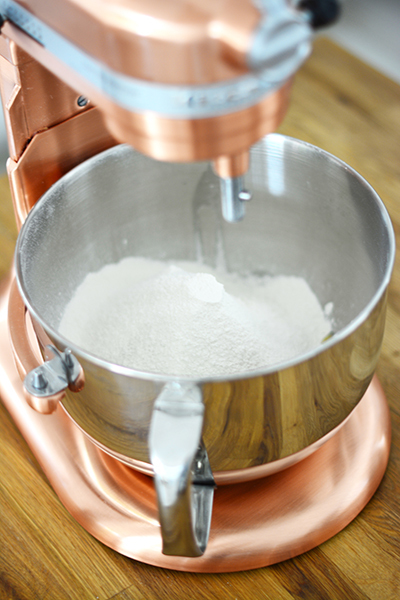 Add the flour, eggs, salt, and water to your KitchenAid® Professional 620 Bowl-Lift Stand Mixer bowl. 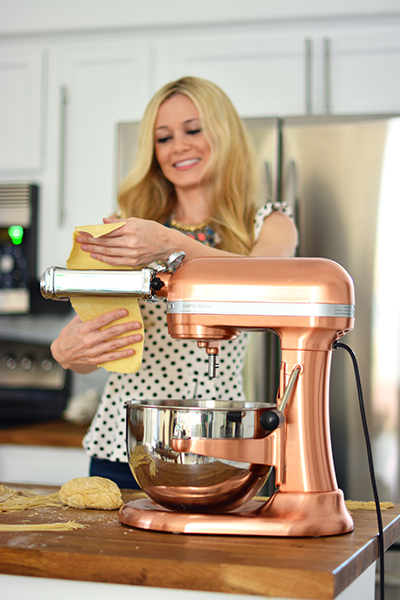 Attach KitchenAid® Pasta Roller onto stand mixer. 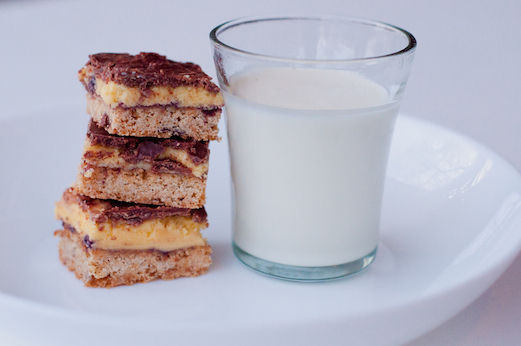 Cut dough into 1 cm thick pieces. Flatten each piece slightly. Set adjustment knob to 1 and speed to 2. Feed dough through the roller. Fold the dough in half and feed it through again. Repeat a couple of times. Then turn the knob to 2. Feed dough through. 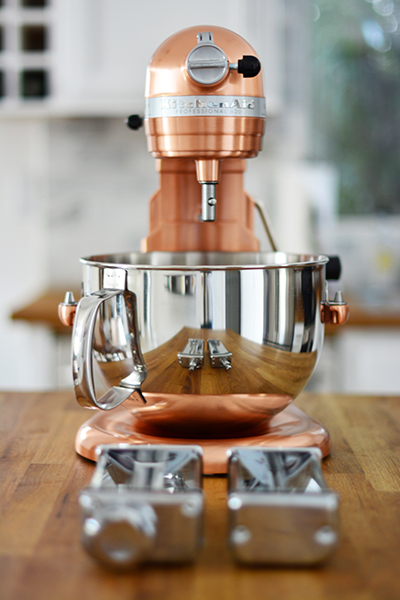 Continue to turn knob up and feed dough through until desired thickness is achieved. At settings 2 or higher, no need to fold the dough before rolling. Add 2 teaspoons salt and 2 tablespoons olive oil to 6 quarts boiling water. 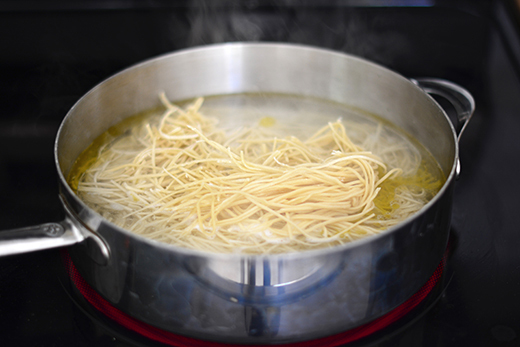 Cook at a boil until pasta is “al dente.” For fresh pasta, cook for about 2-5 minutes, and for dry pasta cook for about 7 minutes. Drain pasta in a colander. 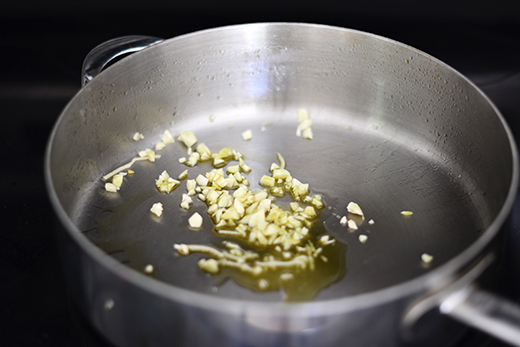 Sauté the garlic in 2 tablespoons of olive oil on medium heat. Be careful not to burn the garlic. Add in pasta, tomatoes, basil, lemon juice, remaining olive oil, mozzarella, and salt and pepper to taste. 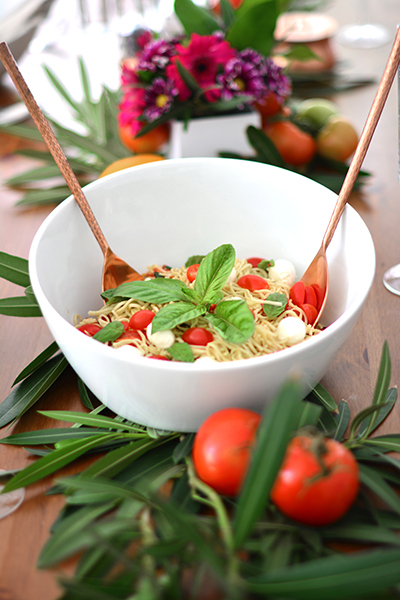 Serve in a large bowl and garnish with fresh basil, salt, and parmesan.